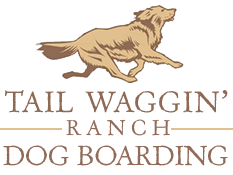 Boarding should be an opportunity for fun and socialization for your dogs, and Tail Waggin’ Ranch Dog Boarding in Bozeman MT makes sure that it is. Unlike traditional kennel-based boarding, which is cramped and confining, and can add to your furry friend’s stress, we have acres of open, grassy areas for dogs to run and play together the way they love. When it’s hot out, there’s plenty of shade, and even a stream to cool off in, and when it’s cold, we have shared indoor areas with couches and a fireplace to keep them warm and safe, while still allowing them to socialize and enjoy themselves. Since we encourage play and socialization, no aggressive pets are admitted, but we also match dogs up into groups that get along well, using separate runs to ensure that every dog will be safe and comfortable, and will never be bored or lonely. We’re here on-site to provide 24-hour care for your pets, and can provide for any extra needs they might have. Owners tell us the socialization their dogs get here makes them more confident and better behaved around other dogs, and that even their most hyper dogs are ready to calm down and relax with the family after a great day of fun and exercise with us. So whether you’re taking a trip through Montana and need a place to keep your dogs happy and healthy during your vacation, long or short, or you just want to bring them out for some regular daytime fun, to let them meet other dogs and make some friends, give Tail Waggin’ Ranch Dog Boarding in Bozeman MT a call at (406)388-PETS. We’ll make sure both you and your dogs are satisfied!